Harry Potter Bolt Mug | Nerd Much? This Harry Potter: Bolt from the Brew Mug is that next Harry Potter collectible you didn’t know you needed. It is officially licensed Harry Potter merchandise, meaning you can be assured that it will be of the highest quality. You won’t need a Reparo spell unless this mug flies out of your hand in search of the snitch. Your love for all things Harry Potter shouldn’t end at the books and movies, so treat yourself to this wonderful mug that even muggles can’t get enough of. Whether it’s taking a snowy trip to Hogsmeade or staying warm under your invisibility cloak, the Harry Potter: Bolt from the Brew Mug will help keep you cozy in any situation. It’s a fun and stylish Harry Potter mug that you can buy for yourself or as the perfect gift for that Harry Potter fanatic that drinks too much coffee (Note: If you don’t have that friend, you are that friend). 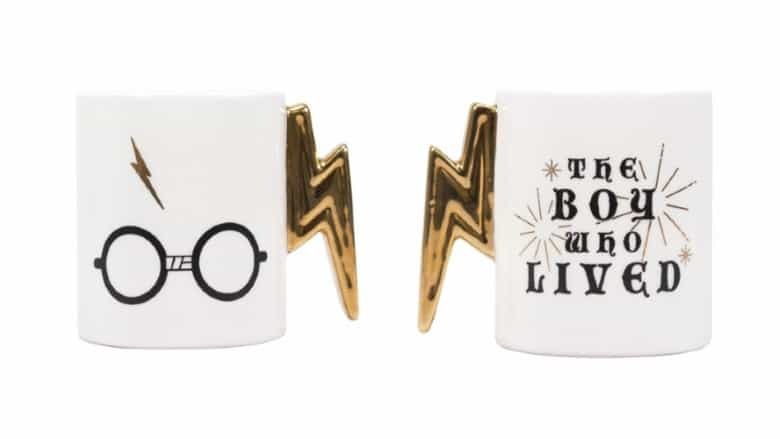 The Harry Potter: Bolt from the Brew Mug is a white colored mug ordained on one side with a drawing of Harry Potter’s famous glasses, as well as the famous lightning bolt scar. Whilst the other side has the famous title ‘The Boy who Lived’ in an ornate design. To top off this awesome cup, the handle is in the shape of a golden lightning bolt, giving you a unique grip that brings you closer to Harry Potter. This mug gives you all the warm and fuzzy feelings that you expect from the Wizarding World of Harry Potter. Discover what all of the fuss is about and get your hands on one of these Harry Potter: Bolt from the Brew Mugs before they are gone.